Want to create a memorable reunion event that captures family history and entertains everyone at the same time? The answer is a Heritage Haunt. A Heritage Haunt consists of tours of family homes, farms, schools, neighborhoods and businesses. It includes favorite restaurants, parks, and bars, and other sites where interesting family events took place. Aside from visiting locations, family history is shared through stories, narration, re-enactments, pictures, antiques and artifacts. Imagine sitting in the same tree where Grandpa Albert carved Grandma Edna’s initials seventy-five years ago. Picture yourself climbing the steps to the hayloft where Aunt Ruth and Uncle Harold had their first kiss. Who couldn’t laugh at seeing the school banister where Albert Jr.’s head was lodged throughout one entire 4th grade recess? These “haunts” are your family’s heritage. They are where stories and memories were born. When you visit, the past is alive, well, and firmly linked to the present. This inexpensive tour is actually a backdrop for an afternoon of stories, music, food, games, and laughter. 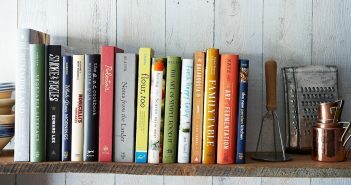 It’s a way for the entire family to participate in a single activity as they connect with each other and their shared past. First, determine which family members or ancestors to focus on for your tour/haunt. Often, families have core members that who are the focal point for the rest of the family. Focus on these people for your tour. Once you select several members, narrow your list to particularly lively characters or families, living or deceased, who are well known by the people attending the reunion. Start by creating a family history sketch to select sites and dig up interesting stories. Search your memory first. Jot down whatever you know about these core members. Where were they from originally (country, city, state)? Where did they live? What schools did they attend? Did they own businesses? Where did they work? Where did they spend time? Which neighborhoods, restaurants, bars, stores and clubs were their favorites? Where did they attend church? Where did the married couples meet? Where did children spend their time? Create a history sketch filled with information about who these members were, what they did in life, interesting events associated with them, and locations or sites associated with the stories. Once you have some ideas, call other relatives and ask for information and stories. From the history sketch, select places to visit. As you consider each site, ask yourself the following questions. Does the site still exist? Is the site interesting because of its history or stories? How long will it take to travel to this site? Is the site an option for a large group? Is it accessible to family members with special needs? Once you’ve selected a site, research it. Find out who owns it; is it public or private property? If possible, research the site’s history before and after your family. Traveling to sites is a large part of the tour as well as an opportunity for your family to connect. If at all possible, try to rent a motorcoach, bus or mini-van to keep the group together. If you choose not to do this, provide maps and a time frame for drivers. Then, caravan and car-pool to sites together. In addition to viewing the site, you need to explain and narrate its history. This is where your research is put to use. Try a number of approaches to narrate stories. Create a script of an event and surprise family members and assign roles AFTER you arrive at the site. Dig up pictures of family members at this location. 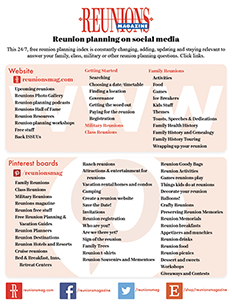 Reunion goers can connect the present and the past, and note changes in the site from past to present. 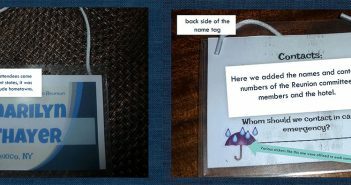 You might also make copies of the pictures and create a booklet. What can you do to add even more fun to the experience? Dress as your family would have 100 years ago. Play music related to sites or the time period as you travel. Hold a barn or street dance. Create a family trivia contest. Display family treasures or heirlooms. Find the quilt Grandma Nette made or the rug that covered Great Aunt Susie’s kitchen floor. Locate antiques previously owned by your family; kitchen tools, farm implements, office machines, ledgers, crochet hooks. Demonstrate the use of old farm, household or business equipment. Video the day’s lighter moments and play the tape later in the day. You’ve done your planning and research. Now it’s time to have fun. Remember to enlist the help of others for the big day. Don’t do it all yourself. Assign jobs and delegate responsibilities to other family members. Remember, what’s really important is the time you spend together. The stories and the laughter are what you’ll remember; so don’t let the details get you down. Happy Haunting! The latest Kuenzel reunion enjoyed a “Heritage Haunt.” At exactly noon, everyone was called together with an enormous, gong-like school bell retired to our backyard from the Kuenzel brothers’ elementary school, our first stop. At the school, Harold told horror stories of trudging through waist-deep snow to school, starting the fire in the wood stove and ringing the enormous bell. The old-timers led us on a story-filled tour of the first homestead. Then we visited the last Kuenzel farm. Old-timers remembered years of love and hard labor while the farm reminded the thirty-year olds of their childhood. We toured the house, where everything seemed much smaller than we remembered. We also toured the barn and outbuildings and took a peaceful walk toward the “back 40.” City kids played with farm animals and explored the hay loft. At a quick visit to the town’s museum we dug through the town’s history and found ways our family contributed. At our central location a home-cooked dinner of family recipes awaited using the family’s antique dishes. Our heritage haunt was completed with food, love, and most importantly, old and new memories. Linda Armstrong is a freelance writer and an alternative school English teacher in Minnesota. In addition to reunion-centered pieces, she also writes a bi-weekly travel column, “Caribbean Travel and Culture” at www.suite101.com/welcome.cfm/1575.